" Aluminium Extending Table & 6 Chairs, Floor Model "
"Glass Top Extending Table with Aluminium Frame"
"Teak Extending Table with Aluminium Frame"
"Chic Aluminium & Glass Table with Aluminium & Sling Fabric Chairs"
"Contemporary Aluminium & Glass Top Table with 8x Aluminium & Sling Fabric Chairs"
"Classic Aluminium Corner Sofa With Khaki Cushions"
"Classic Aluminium Corner Sofa With Grey Cushions"
"Stylish Aluminium & Glass Table with Designer Aluminium Chairs & Cushions"
"Stylish Aluminium & Glass Table with Designer Aluminium & Sling Chairs"
"Classic 5 Piece Aluminium Sofa Set With Khaki Cushins"
"Contemporary Aluminium & Glass Table with Aluminium & Sling Fabric Chairs"
"Stylish Aluminium & Glass Table with Aluminium & Sling Fabric Chairs"
"Modern Extending Dining Set! 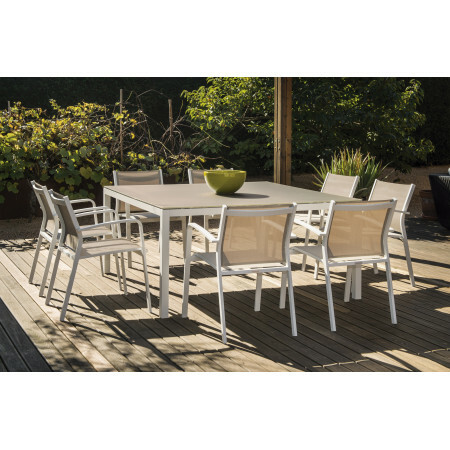 Table in White Aluminium & Grey Glass, Chairs in White Aluminium & Sling Material Silver"
"Modern Aluminium & Glass Table with Aluminium & Sling Fabric Chairs"
"Elegant Sofa Set with Water Resistant Cushions! Aluminium in Champagne, Cushions in Khaki"
"Sleek & Modern Aluminium Corner Sofa with Center Table"
"Stylish Aluminium Corner Sofa with Water Resistant Cushions"